There’s a lot of noise on the internet today, with everyone screaming backlinks, social signals, guest blogging, and all the recent fads that come and go like the wind. However, without content, you’re going nowhere. This is not just about SEO. Every aspect of online marketing requires content to achieve success with it…and not just any type of content – good content is needed. Content that educates, informs, and satisfies. That’s all there is to it. Word count doesn’t mean much if all of your visitors are bouncing off your gigantic pieces of content. Take a look at any high-traffic website and you’ll discover lots of content on it. It doesn’t have to be Amazon or Forbes. Grab the URL of any top ranking site in your niche and you’ll find that the owner(s) have invested a good amount of effort or money publishing content over the months and years. Even tiny niche sites need a good amount of content to get traffic. When was the last time you saw a 5-page site getting thousands of visitors? Search engines rank content, and they’re constantly on the lookout for new content to rank. So, it only makes sense that the more content you have, the greater the amount of traffic you will receive. This doesn’t mean that a site with 100 pages of content will get more traffic than a site containing 50 pages of content. What I mean is that an increase in content always leads to an increase in traffic for any particular site, if done right. 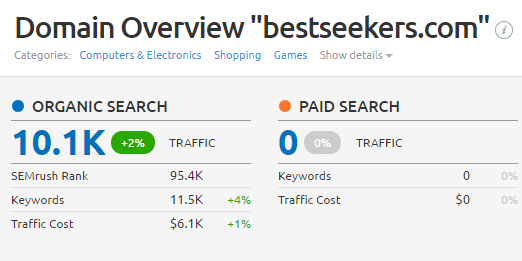 Here’s a case study on how adding 500 pieces of keyword-focused content on a site doubled its organic traffic in just 3 months. Also, I believe websites with more pages of quality content gain more search engine trust than smaller sites. Take a look at it this way, if you were Google, which site would you rank higher? A 5-page mini site on a certain topic or a 100-page authority site on the same topic? If you’re focusing on social traffic, visitors come to your site through the posts you share on social platforms. If you don’t publish new posts constantly, you’ll have nothing new to share, and your traffic will gradually decline. Content is not just important for your site. If you’re building links using tools, you need content. If you’re building Private Blog Networks, you need content. If you’re promoting your site using guest posts, you need content. In a nutshell, if you’re not ready to invest time or money in creating content for your site, you’re better off not getting started in the first place. Let’s face it, there are more internet marketers willing to spend money on things like backlinks, building PBNs, buying social signals, etc. than there are willing to spend money on content. Even if they do spend money on content, they cheap out on it. They skimp on content because content is expensive. That’s the biggest problem with content. So, instead of buying quality articles or spending time writing them, they get or publish cheap, low quality articles that do more harm than good to their sites. Low quality content does the opposite of everything above. It kills your site slowly. So, what’s the solution to this hindrance to publishing quality content? The first solution I’d suggest is to resolve to write quality content and put in the effort required to do so if you don’t have the cash to spend. If you do have the cash, spend it. That said, there is a much better solution that gives you access to tons of quality and unique content without the need to spend any money or effort writing content. That solution is Spinner Bros. More on this in the next post.